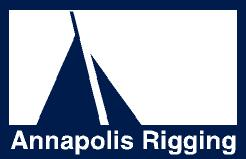 The life span of rigging depends on how heavily a boat has been sailed and on the care taken with tuning. If the leeward shroud flops around underway, the constant flexing will weaken the metal over time and make it more prone to fail. Every five to six years, the mast should be pulled out of the boat so all fittings and wire or rod can be carefully inspected. “The biggest thing we like to have is the history of the boat: what kind of boat it is, how it’s been sailed and where has it been sailed,” says Jay Herman, owner of Annapolis Rigging. “That history will affect what kind of life you get out of your standing rigging.” Some insurance companies, he says, will require a re-rig if you’re purchasing a used boat that has standing rigging older than 15 years. 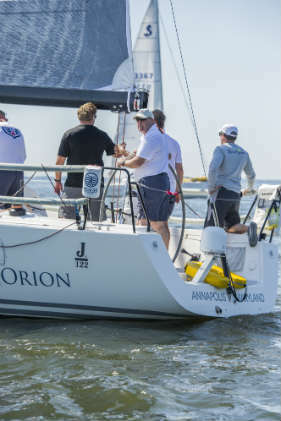 Orion almost didn’t make it to the starting line for the Annapolis to Newport Race. The J/122, owned by Annapolis Yacht Club member Paul Milo, was dismasted during Key West Race Week and repairs took much longer than expected. Milo said the new mast showed up two weeks before the June 2 start and it was a mad scramble to get it stepped into the boat.Jay Herman of Annapolis Rigging did a remarkable job of getting the rig ready, earning high praise from Milo for his efforts. Several other industry professionals in the Annapolis area also contributed to making sure the J/122 was properly prepared for an offshore passage. Orion put forth a fantastic performance, leading the entire fleet for much of the way and capturing line honors among the Friday starters with an elapsed time of 3 days, 5 hours, 32 minutes, 27 seconds. The J/122 wound up winning IRC 2 class on corrected time by about 21 minutes over Kenai, a J/44 skippered by Chris Lewis.